Bacon and eggs are a great FODMAP friendly way to start your day. But, they can also leave you stuck in a breakfast rut. 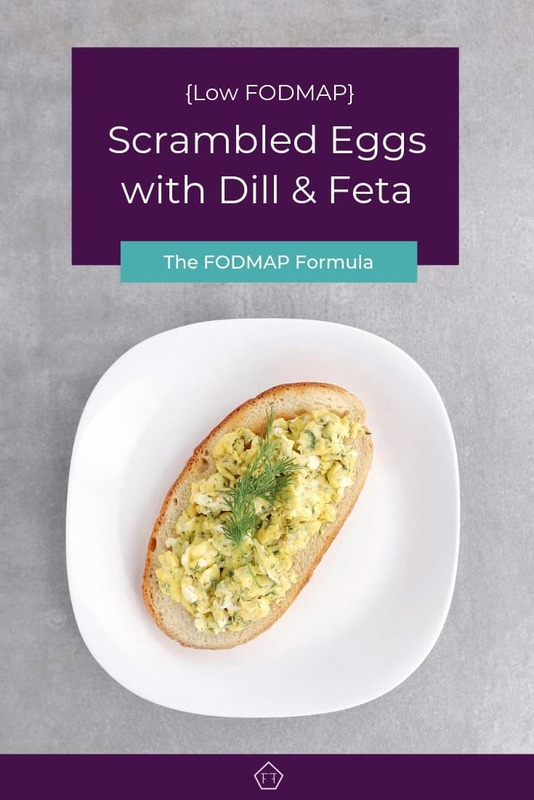 Shake up your morning with these low FODMAP scrambled eggs with dill and feta. With a silky smooth texture and a little zip, these scrambled eggs will put some pep in your step. The first time I tried these scrambled eggs, I was a little wary. 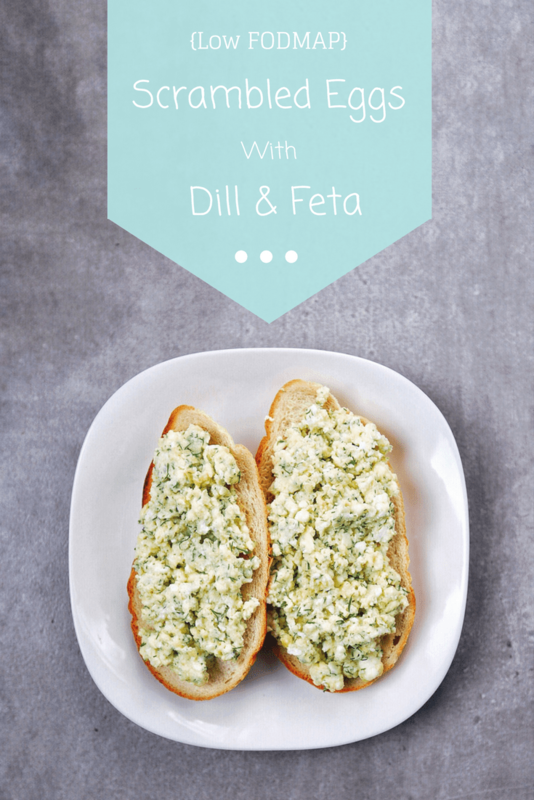 Dill and feta have pretty strong flavours, and I wasn’t sure if they would cooperate. But let me tell you, they’re a match made in heaven. 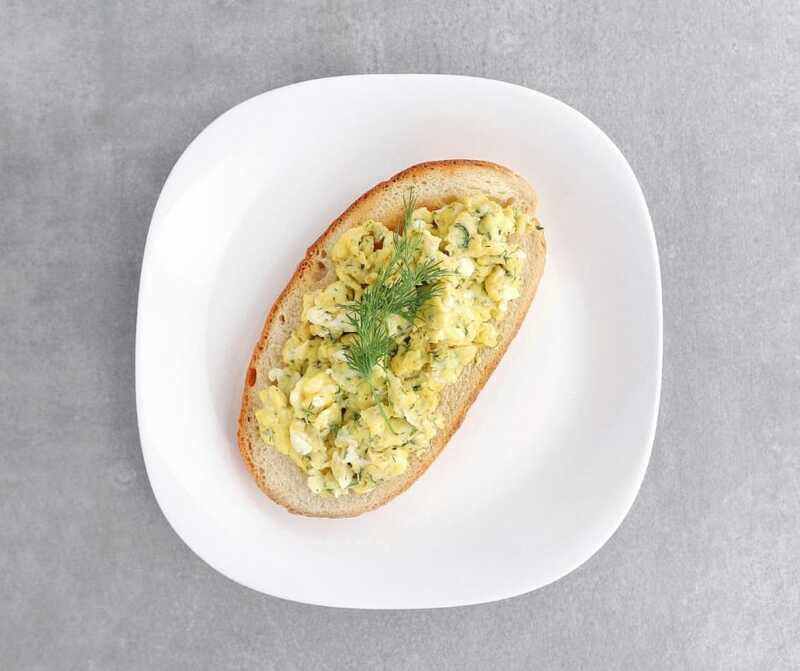 If you want these scrambled eggs to really shine, try serving them on sourdough toast. The sweet, tangy flavour will take your breakfast to a whole new level. Think these low FODMAP scrambled eggs sound great, but you don’t have time to try them now? You can PIN THIS POST for later. 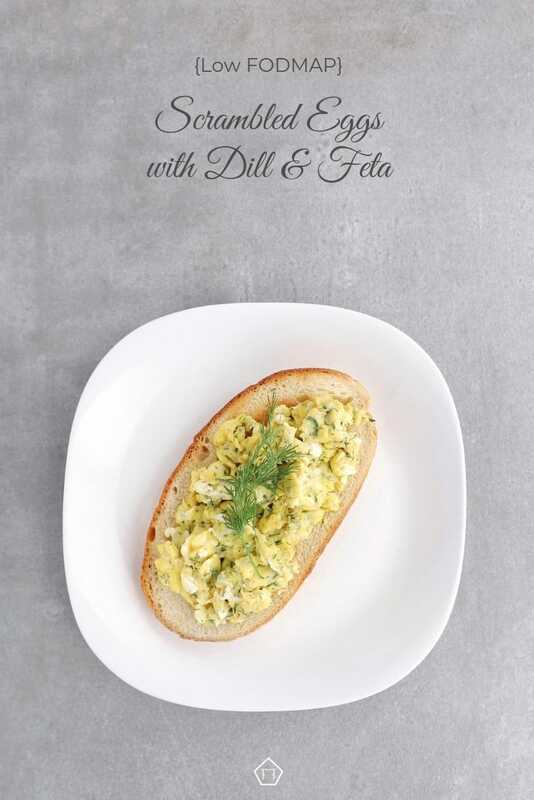 These low FODMAP scrambled eggs with dill and feta will get your morning off to a great start. Check out the notes below for tips on keeping this recipe FODMAP friendly. First, eggs are a protein, so they don’t have any FODMAPs. That means they won’t contribute to your FODMAP load. However, some people have problems digesting too much protein in one sitting. If you have trouble digesting eggs, try having one egg per sitting or eating your eggs with other foods (like toast or FODMAP friendly fruit). This recipe also uses feta cheese. Hard cheeses are safe in small servings on the low FODMAP Diet because the lactose is broken down during the fermentation process. According to Monash University, feta is safe in servings of 1/2 a cup per sitting. This recipe uses 1/4 cup of feta, which works out to 2 tbsp per serving. This is well within the recommended range. 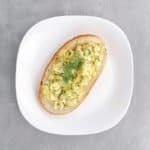 If you want to serve your scrambled eggs on toast you’ll need to use gluten-free bread. I like long-rise sourdough bread. Bacteria break down the fructans in the wheat while the bread ferments and rises. This means traditionally made sourdough bread is low FODMAP even though it contains wheat. Sourdough bread is not gluten-free, though, so this is not an option for people with celiac disease. Want to try these low FODMAP scrambled eggs? Don’t forget to PIN THIS POST for later. In the mood to shake up your eggs? 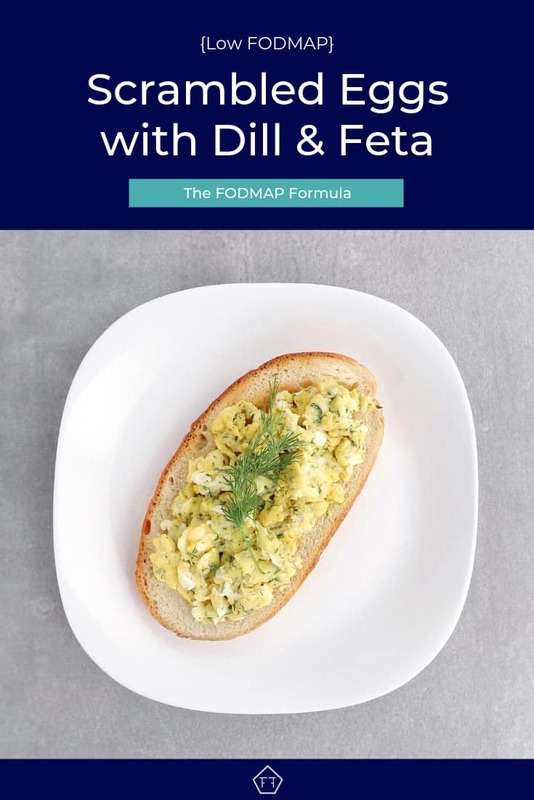 Try these low FODMAP scrambled eggs with dill and feta. With a smooth, silky texture and a bit of zip, these scrambled eggs will start your day off right. Whisk together eggs, feta, dill, pepper, and salt in a small bowl. Heat oil in a nonstick pan over medium-low heat. Add egg mixture and gently stir until the eggs are creamy and just set (about 5 minutes). Serve warm on toast. The morning can get a little chaotic, but the trick to these delicious, silky eggs is to go low and slow. These low FODMAP scrambled eggs with dill and feta will shake you out of any breakfast rut. If you like this recipe, make sure to sign up for my mailing list below. Click the “sign me up” button below and you’ll get new recipes and articles delivered right to your inbox. Want more breakfast inspiration? Follow me on Pinterest for even more FODMAP friendly ideas. Together we’ll get the low FODMAP Diet down to a science! Your recipes are fantastic. So excited to try more of them. I’m glad you’re enjoying them. I hope you find some more gems in the recipe section. Don’t forget to come back every Thursday for new recipes and articles. Lol! I’m glad you found it. Enjoy!